What a beautiful place! 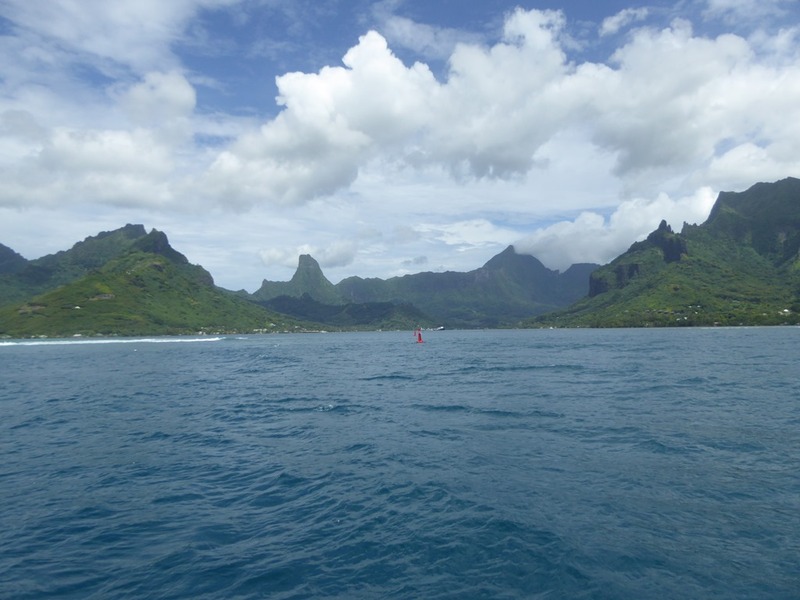 With little wind we motor sailed around to the N side of Moorea and went in to Cooks Bay and anchored well up the bay at 17 30.271S 149 49.224W in 40’ of water. 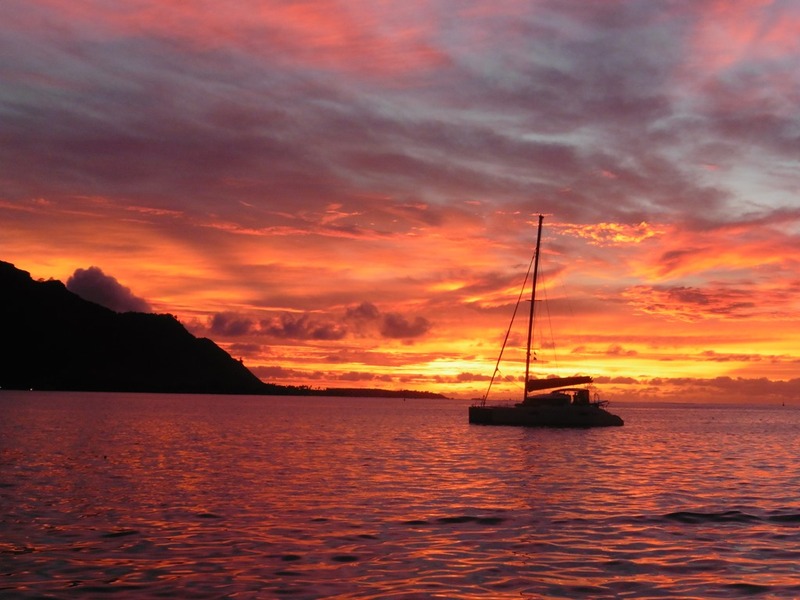 Ironically the good Capt Cook didn’t actually use this anchorage but I think he would be pleased as it is beautiful. We only stayed for a night as whilst the anchorage was deep and safe with a good mud base, the bay was brown with the run off following some heavy rain. 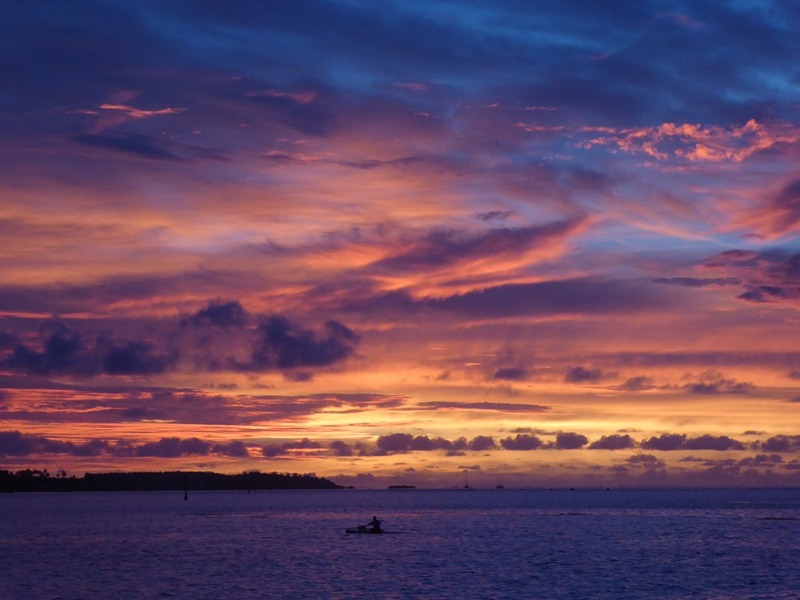 We left Phylis and headed around to the far prettier anchorage behind the reef at Opunohu Bay, two miles W of Cooks Bay. And what an anchorage! We joined about a dozen other yachts anchored in 12’ on white sand 100m behind the reef at 17 28.976S 149 48.737W. We finally got to meet Avatar and Jacaranda, names I’d been hearing on the SSB net for more than a year. 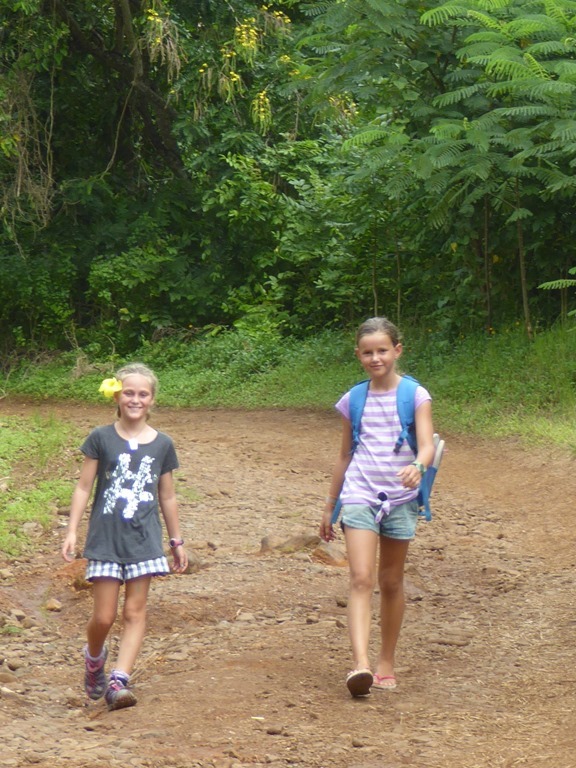 And within a day or so, we met up again with Emma Louise and then Reao as they arrived in as well. 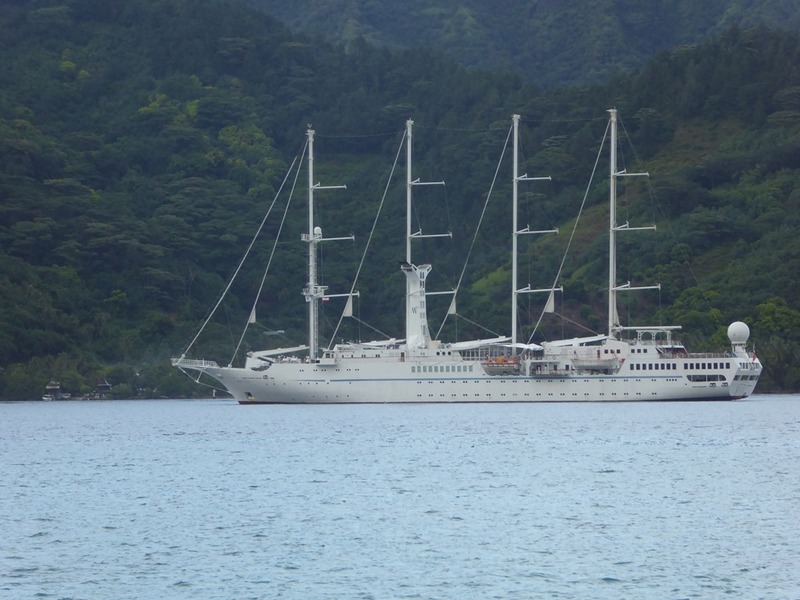 Moorea is a popular stop and not just for the cruiser fleet. We had a succession of superyachts and cruise liners in. I think that Wind Spirit is the prettiest of them. It does have sails and will even occasionally run them out. We had some more rain. Lots of it. With torrential rain we had the advantage of free showers and the waterfalls on the cliffs above us sprang into life and looked great for a day or so. As the anchorage at Opunohu Bay is right at the edge of the reef we weren’t bothered by run off and we kept our clean white sand surround throughout. With the wild weather came glorious sunsets. My thanks to Sheryl on Emma Louise for one of the best we have ever had taken of Skylark. I’m pretty sure she is taking a picture of me taking a picture of the paddler! 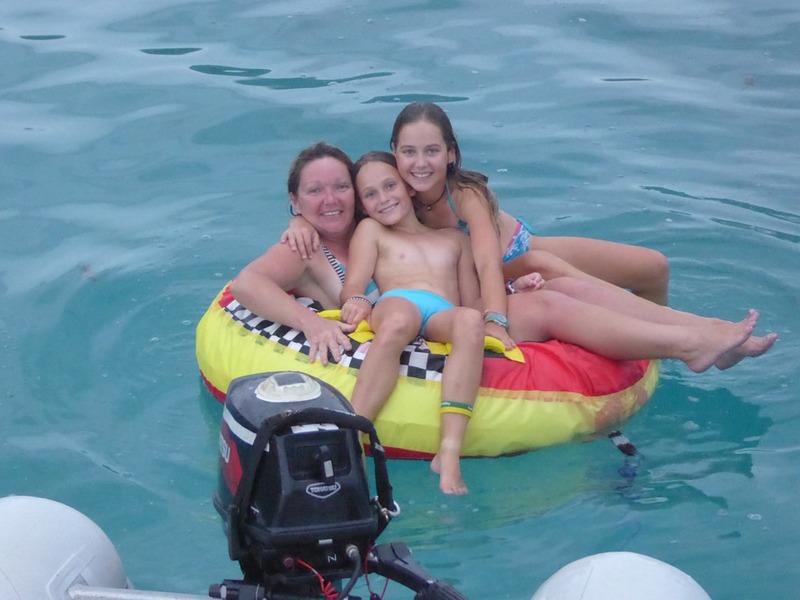 The kids played with a new toy – a big drag ring that Mary Ann II passed on to us after it failed to help Julia in her search for an easy way to get in to the dinghy. It is greatly appreciated and is being well used and abused. And then, joy! A kids boat! 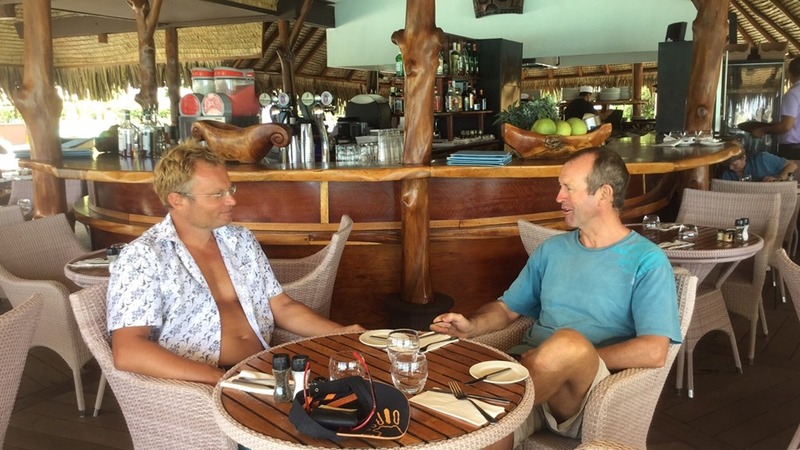 Lou had put where we were up on the Kids4sail Facebook page and a CA boat, Stop Work Order, had followed through and came to meet up. The whole family was a delight. Truly and Hannah hit it off and Eleanor and Cameron hung out too. I think big sister, Ciara, enjoyed a bit of peace from the smalls too but did come across for the sleepover we had when Pat and Corise headed ashore to celebrate their 20th wedding anniversary. One morning, Truly came to do school with us. Most afternoons were spent exploring the local area and throwing themselves in off one of the boats. 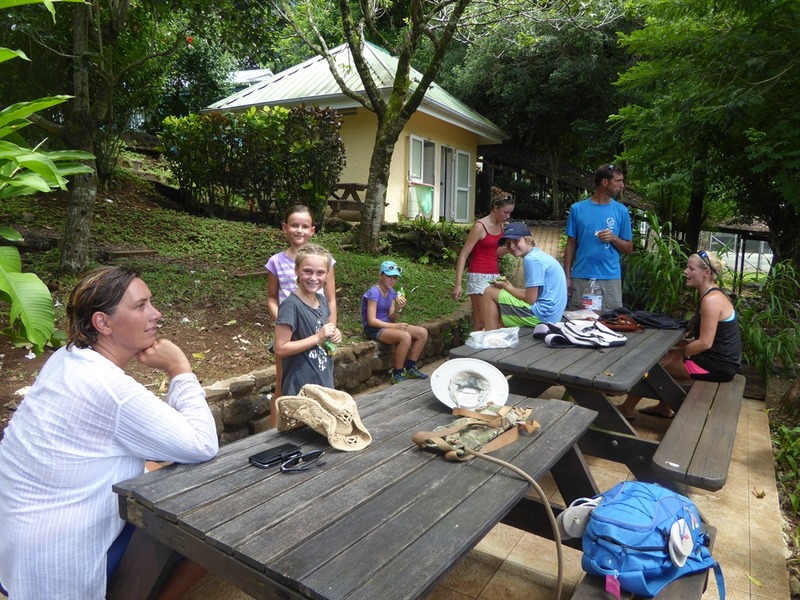 Eleanor and I had gone to ask Top Dive about diving with them and for refilling our bottles. 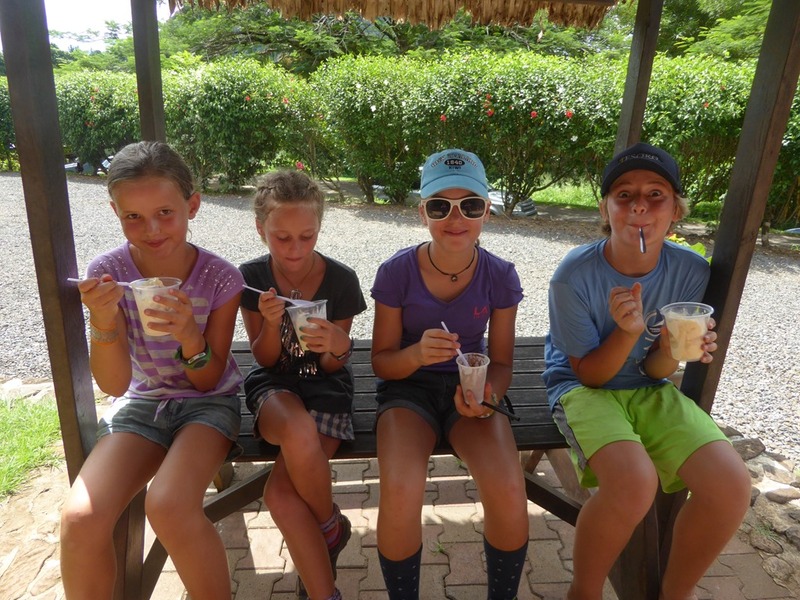 $85 a single dive and $30 for a refill is the highest we have encountered anywhere, Pacific or Caribbean. We left in the huff. However, we found out that Pat and Corice dive and in Cameron, we found another junior diver. We managed to get one dive in on the outside of the reef and Pat was kind enough to refill our bottles. The dive sight we choose was 400m to the E of the Opunohu Bay entrance (look for a string of white buoys placed out by the dive boats). We dropped in with a fair amount of surge and enjoyed rolling over the banks of coral running out as spines from the reef. We were a little surprised by a big Silvertip coming to have a look at us. 10’ of shark which the book says is in the “dangerous” category always looks big close up! We also did some snorkelling. 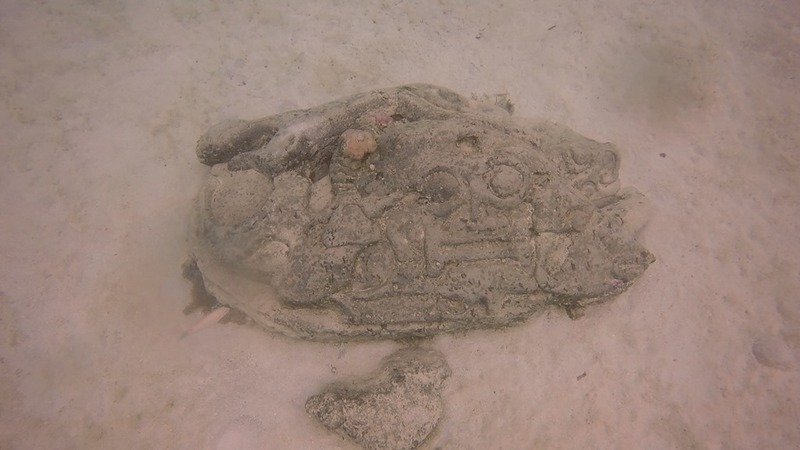 When the missionaries got their teeth into the locals, tiki, the revered carved in stone representations of their ancestors overnight became “heathen idols”. Rather than just destroy them, some of the locals rebelled and moved three huge tiki out to the edge of the reef where they remain. In just ten feet of water, they are in great condition. Find them at a white ball near 17 29.224S 149 52.735W. Swim N towards the reef. They are within 30m. 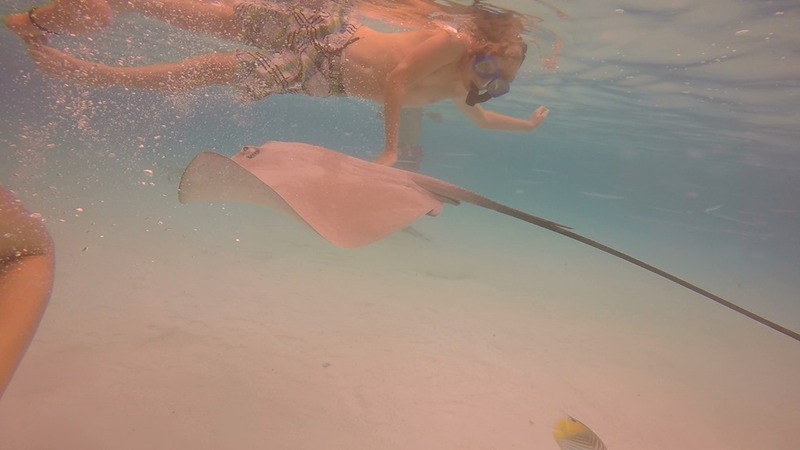 Just 400m W of the Intercontinental Hotel is a sandbank on the edge of the inside channel where rays and sharks have become used to tourists feeding them at 0830hrs each morning. It was a long dinghy ride around but so worth it. 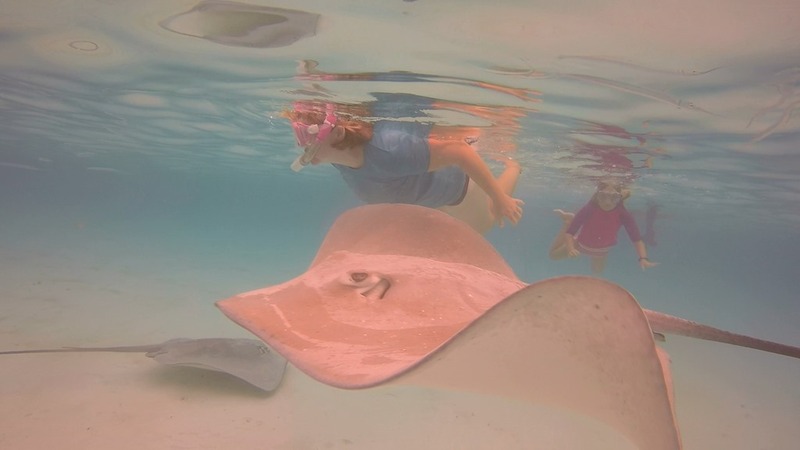 We had lots of over friendly Stingrays mobbing us and the Black Tip Reef sharks cruised around us without ever getting too close. It was marvellous. Whilst we didn’t have the chunks of fresh tuna that Plastik Plankton suggested were favourites, the tinned stuff we had seemed to go down pretty well too. 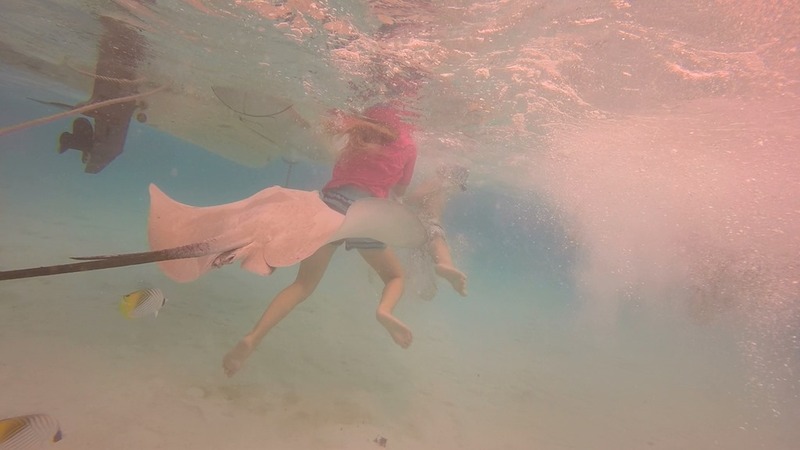 Word of advice – if you don’t want to be jumped by Stingrays stay horizontal in the water. As soon as you go upright, they crawl all over you! 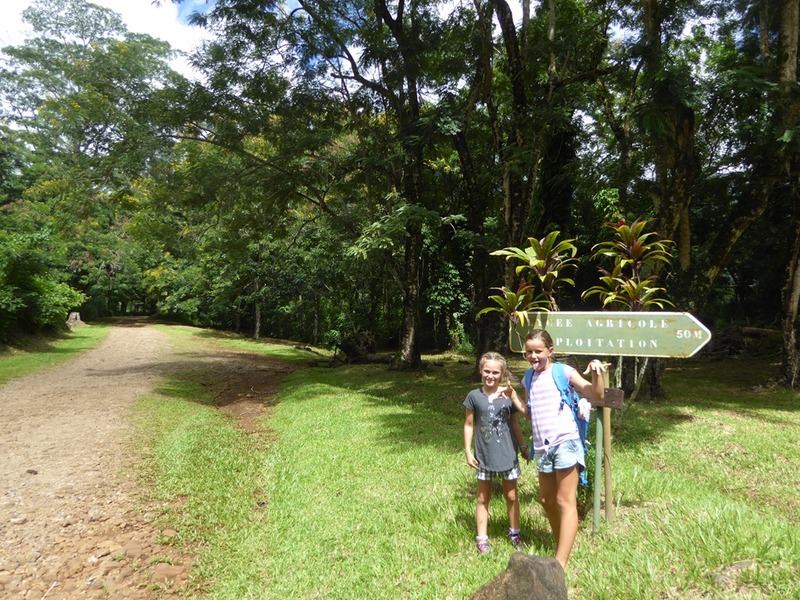 We had one major expedition towards the Belvedere view point, a high point between Cooks and Opunohu bays. We didn’t quite make it but got some great views on the way and courtesy of the café at the Agricultural Research Station, some of the best vanilla ice-cream ever. 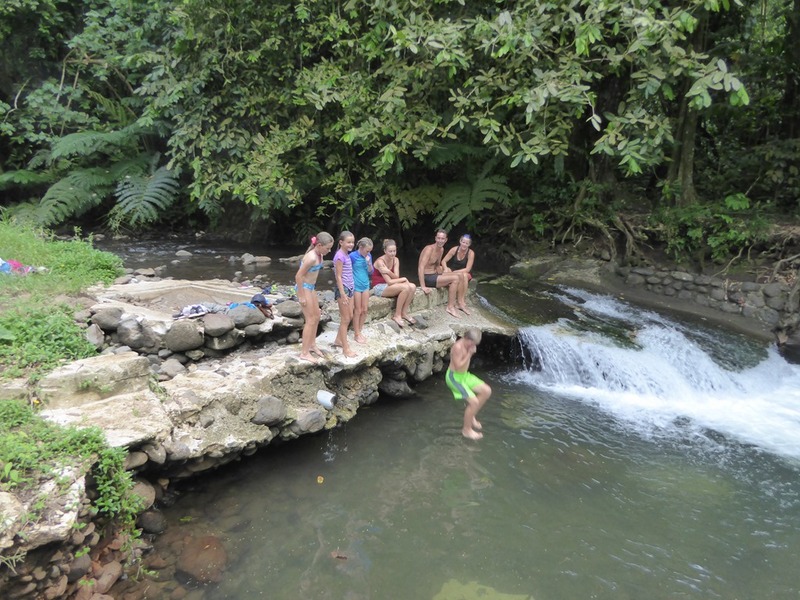 A mistake in route selection on the way down turned out to be a fortunate one as we found a river with good pools to jump in to to cool off. I stayed behind to help Craig and Steve track down the problem with Craig’s engine which had suddenly just decided to stop working. It took several hours to track down a split pipe, very slowly leaking in a difficult to see spot, letting air into the system. Once we found the leak it was quickly fixed. We celebrated with a spot of lunch at the nearby Hilton. 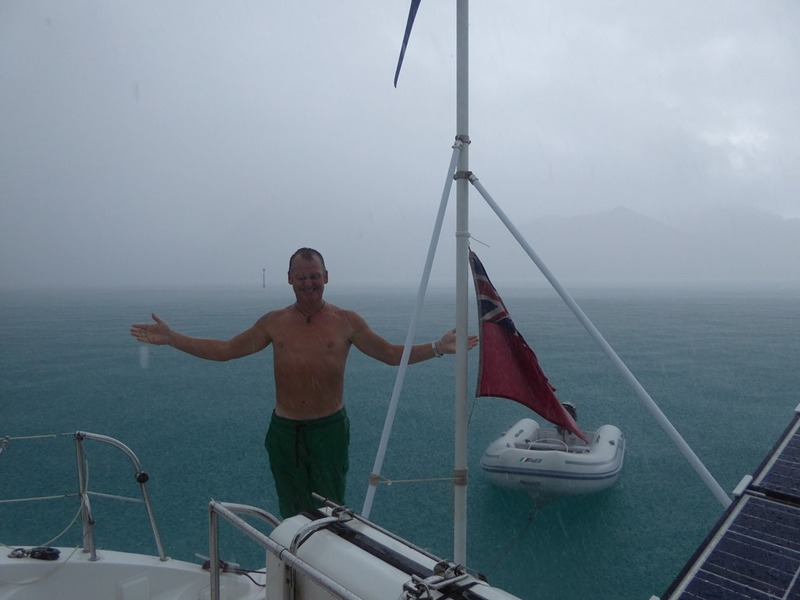 We said our goodbyes as we choose to move before a new system bringing wind from N arrived, exactly where we wouldn’t want it from for the overnight passage up to Huahine. 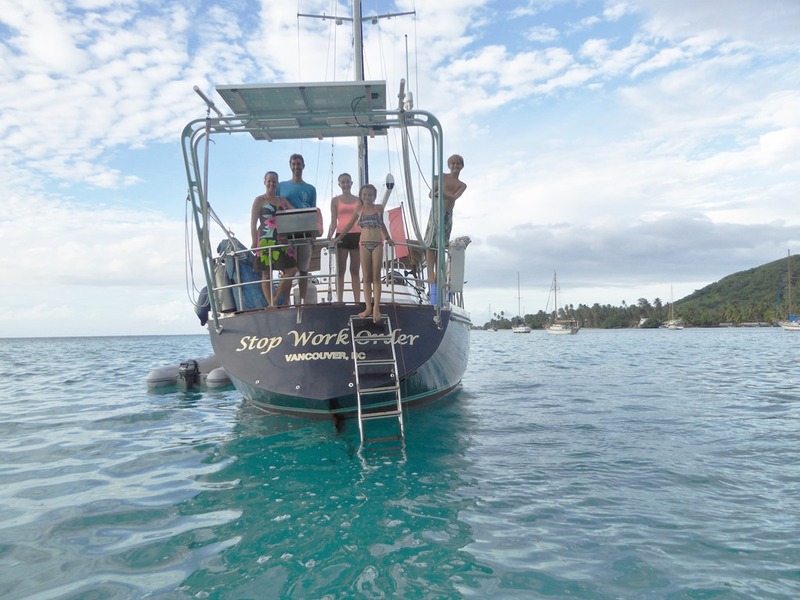 There were tears when we said goodbye to Stop Work Order as they are heading back to Tahiti to pick up some parts but we hope that our routes will intertwine again sooner rather than later. 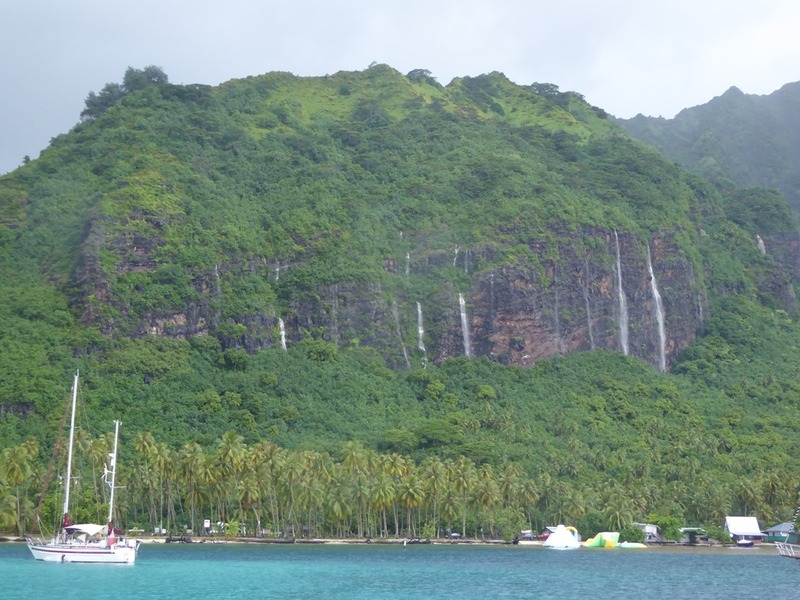 Moorea is spectacular. 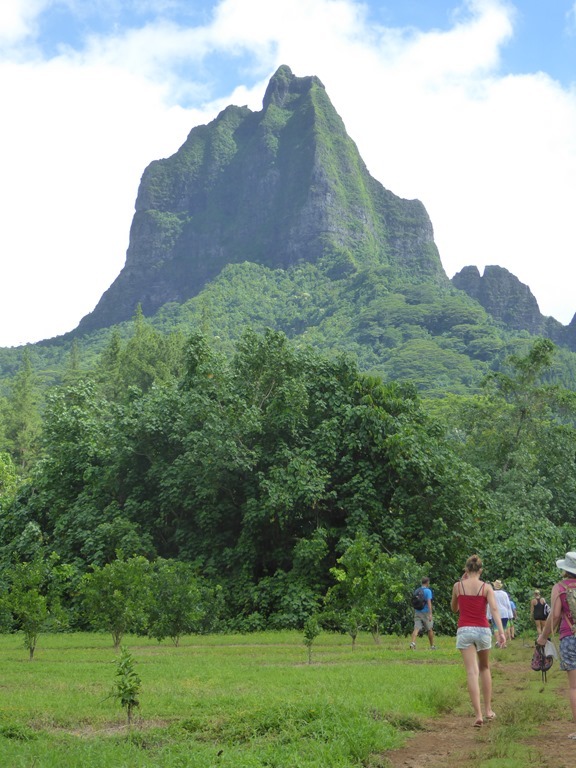 If I was to describe the views in the bay then I’d say think Fatu Hiva and the Bay of Virgins and think BIGGER! 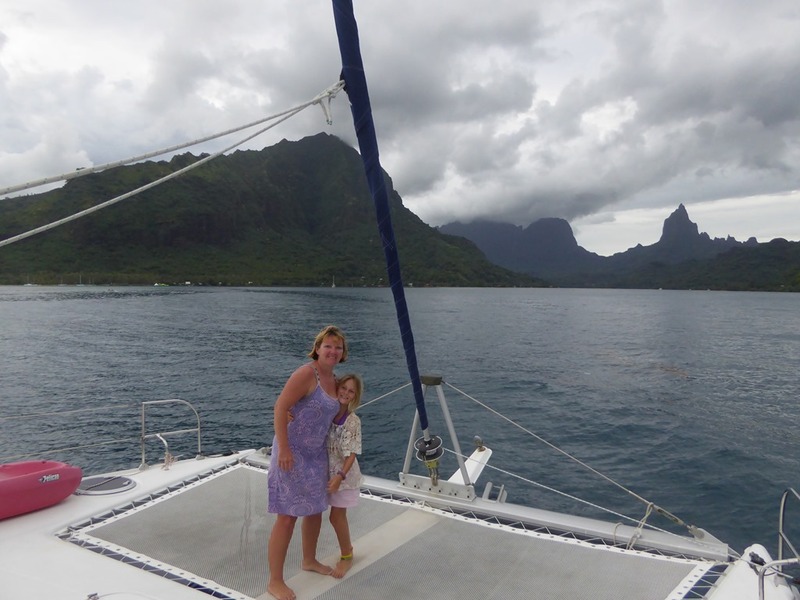 We enjoyed being back on a white sand anchorage after the deep Rangiroa and the not so clean Tahiti. 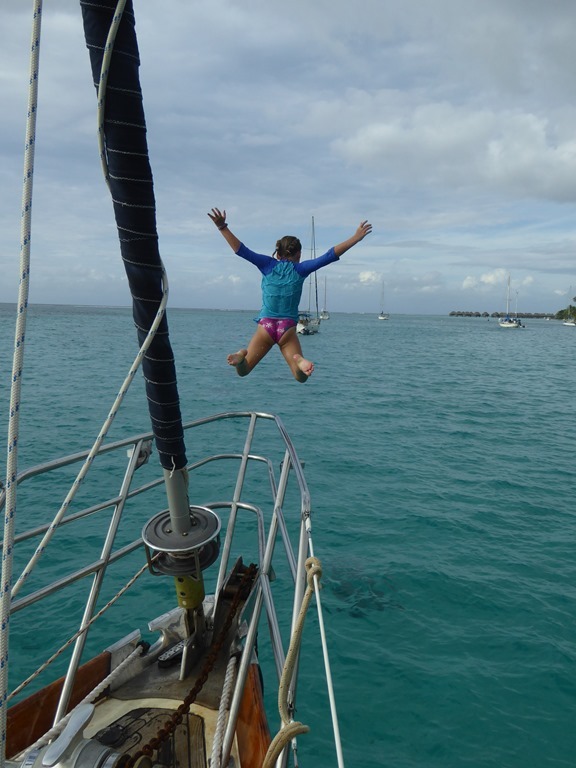 It is just a joy walking off the back of the boat into warm clear water. And a pleasure to be back into a cruising community again – we have missed it. We are looking forward to being around a lot more boats this year as we travel continue our travels W.